The ProGuard tool shrinks, optimizesstatic innerand obfuscates your code by removing unused code and renaming classes, fields, and methods with semantically obscure names. 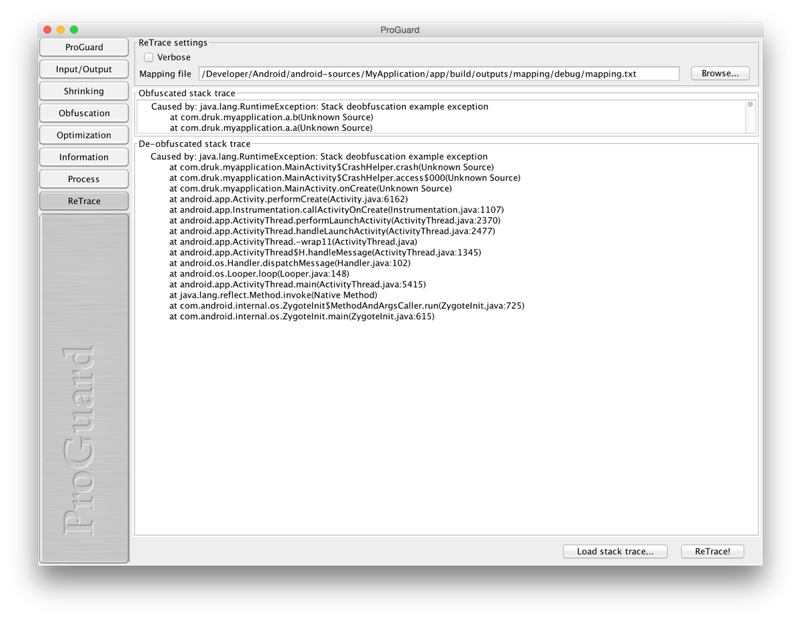 By default ProGuard will keep names for all inheritors of android.app.Activity. Ok, I created an inner static class to avoid this rule. It’s exactly what we are looking for: the exception was thrown in method b of class a that was called from method ‘a’. The first rule is already in Android project by default, we will skip it. The second rule will switch on saving of source filename and table of line numbers. But the most interesting is the third one that will change all filenames to Source file. It’s critical for languages like Java where filenames are usually the same to class name. Also, it will hide relations between inner and outer classes. To summarize, I would strongly recommend you to keep all mapping files for your release builds to be able to deobfuscate stack traces from crash logs. The best practice is building releases on your CI server with saving apk and mapping file with tags of releases. In this case, you will always know where you can find a mapping file for you release build. Also, there are a lot of services that provide automatic deobfuscation of stack traces such as Fabric or Google Play Developer Console. But keep in mind that you provide your mapping file to a 3-rd party service, and they can deobfuscate your builds and get all the source code.